STUDENTS hoped to make it to the finish line iwthout spilling their water during the first leg of last year’s Walk-a-Thon. Exercise will be the focus on Fri., March 15 when students, teachers, staff and parents take part in a Walk-a-Thon at Third Street Elementary School. Activities will include walking the track, dodgeball, cup stacking, freeze dance and more. Proceeds from the event—one of four annual fundraisers sponsored by Friends of Third—will help to bridge the gap between what the Los Angeles Unified School District provides and what students need, said Jennifer Rissier, co-chair with John Perfitt. “Needs vary from library and technology services to campus clean-up and security, music and more,” she added. The $45,000 the booster club hopes to raise at the Walk-a-Thon will go toward a year-end goal of $280,000. 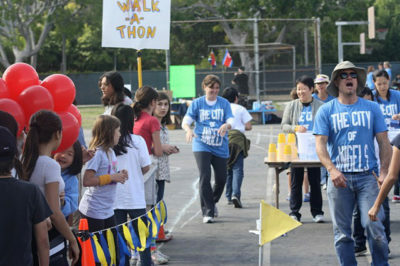 In addition to sponsoring participants, tax-deductible donations may also be made online at friendsofthird.org/walkathon.